There you are, mid-recipe, and you realize that the ingredients list doesn't say milk. It says buttermilk. Or maybe you knew going in that it said buttermilk, but you balked at spending the money to buy a whole quart when you only needed a small amount. Fear not. 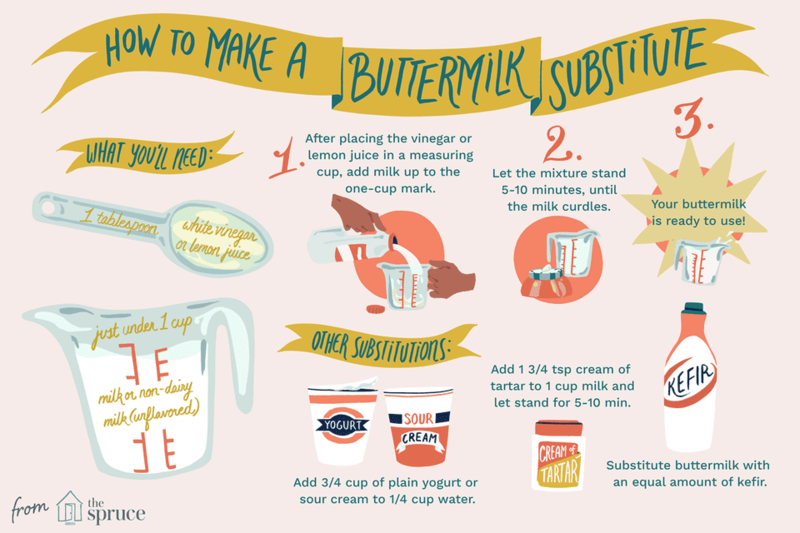 Any of these substitutes can be used in place of buttermilk, and they'll save you a little money, too. All you need to create your own batch of buttermilk is regular milk—just a little less than a cup—and a tablespoon of white vinegar or lemon juice. Place the white vinegar or lemon juice in a liquid measuring cup and add enough milk to bring the liquid up to the one-cup line. Now let the mixture stand for 5 to 10 minutes, long enough for the milk to thicken and curdle. Voila—buttermilk! Use as much of the batch as your recipe calls for. If you're cooking for someone who has a dairy sensitivity, this works with non-dairy milk, too. If you only have soy milk or almond milk in the fridge, that's fine, but you'll want to stick to an unflavored variety. Yogurt: Add regular milk or water to thin plain yogurt to achieve the consistency of buttermilk. About 3/4 cup yogurt mixed with 1/4 cup water usually works well. Sour cream: Combine sour cream and either milk or water to create a buttermilk consistency. About 3/4 cup sour cream and 1/4 cup water should do the trick. Cream of tartar: Add 1 3/4 teaspoon of cream of tartar to a cup of milk and let it sit for 5 to 10 minutes. The milk will thicken and curdle just like the substitute made with vinegar or lemon juice. Kefir: Replace the buttermilk called for in your recipe with an equal amount of kefir if you have any on hand. It contains lactic acid, just like buttermilk does, so it will do the same job. These substitutes create a good flavor approximation of buttermilk, but they do a lot more than that. Whenever you see a pancake, quick bread or batter recipe that calls for buttermilk, it's there to act as the acid in the recipe. When the acid in the buttermilk interacts with the baking soda in the recipe, it ​leavens the batter or dough. This allows it to rise without the addition of yeast. Your baked goods will still be light and fluffy. This is why so many pancake recipes include buttermilk. All the buttermilk substitutes outlined above include an acid to perform this important function in your recipe. If you never seem to have buttermilk when you need it, or if you buy some for a recipe but most of it goes bad before you find another use for it, consider switching to powdered buttermilk. Similar to powdered milk, it can be reconstituted whenever you need it and in whatever quantity you need. Saco is the most common brand. Look for it near the powdered milk at the grocery store, or order it online. So there you have it. Never spend your hard-earned dollars on store-bought buttermilk again. With a little creativity and a few ingredients that are probably already in your cupboard, you don't have to.